Description of the Oyster - Controversies about Oyster-Life - Do Oysters live upside down? - The Spawning of Oysters - Oyster-Growth - When do Oysters become reproductive for Dredging? - Sergins Orata - Lake Fusaro - Oyster-Fascines - Ile de Re, and Growth of the Park System - Economy of the Parks - Greening the Oyster - Oyster-Growth - Spat Collectors - Miscellaneous Facts. Zoologically the oyster is known as Ostraea edulis. Its outward appearance is familiar to even very landward people, and no human engineer could have invented so admirable a home for the pulpy and headless mass of jelly that is contained within the rough-looking shell. Many curious opinions have been held about this shell-fish. At one time oysters were thought to be only masses of oily or other matter, scarcely alive and insensible to pain. Who would suppose, it was asked, that a portion of blubber like the oyster, that could only have been first eaten by some very courageous individual, would have any feeling? But we know better now, and although the organisation of the mollusca is not of a high order, it is perfect of its kind, and has within it indications of organs that in beings of a higher type serve a loftier purpose, and point out the beginnings of nature, showing how she works her way from the simplest imaginings of animal life to the complex human machine. The oyster has no doubt in its degree many joys and sorrows, and throbs with life and pleasure, as animals do that have a higher organic structure. The oyster is curiously constructed; but I fear that, comparatively speaking, very few of my readers have ever seen a perfect one, as oysters are very much mutilated, being generally deprived of their beards before they are sent to table, and otherwise hurt, both accidentally in the opening and by use and wont, as in the case of the beard. Its mouth—it has no jaws or teeth—is a kind of trunk or snout, with four lips, and leafy coverings or gills are spread over the body to act as lungs, and keep from the action of the water the air which the animal requires for its existence. This covering is divided into lobes with ciliated edges. Four leaves or membranous plates act as capillary funnels, open at the farthest extremities. Behind the gills there is a large whitish fatty part enclosing the stomach and intestines. The vessels of circulation play into muscular cavities, which act the part of the heart. The stomach is situated near the mouth. The oyster has no feet, but can move by opening and closing its shell, and it secures food by means of its beard, which acts as a kind of rake. In fact the internal structure of the oyster, while it is excellently adapted to that animal's mode of life, is exceedingly simple. It is not my purpose in the present work to enter into the minutiae of oyster life. Indeed, there have been so many controversies about the natural history of this animal as to render it impossible to narrate in the brief space I can devote to it a tenth part of what has been written or spoken about the life and habits of the " broody creature." Every stage of its growth has been made the stand-point for a wrangle of some kind. As an example of the keenness with which each stage of oyster life is now being discussed, I may mention that some years ago a most amusing squabble broke out in the pages of the Field newspaper on an immaterial point of oyster life, which is worth noting here as an example of what can be said on either side of a question. The controversy hinged upon whether an oyster while on the bed lay on the flat or convex side. Mr. Frank Buckland, who originated the dispute, maintained that the right, proper, and natural position of the oyster, when at the bottom of the sea, is with the flat shell downwards; but the natural position of the oyster is of no practical importance whatever; and I know, from personal observation of the beds at Newhaven and Cockenzie, that oysters lie both ways,-indeed, with a dozen or two of dredges tearing over the beds it is impossible but that they must lie quite higgledy-piggledy, so to speak. A great deal that is incidentally interesting was brought up in the Field discussion. There have been several other disputes about points in the natural history of the oysters-one in particular as to whether that animal is provided with organs of vision. Various opinions have been enunciated as to whether an oyster has eyes, and one author asserts that it has so many as twenty-four, which again is denied, and the assertion made that the so-called eyes projecting from the border of the mantle have no optical power whatever ; but, be that as it may, the oyster has a power of knowing the light from the dark. As is well known, there is a period every year during which the oyster is not fished ; and the reason why our English oyster-beds have not been ruined or exhausted by over fishing arises, among other causes, from there being a definite close-time assigned to the breeding of the mollusc. It would be well if the larger varieties of sea produce were equally protected ; for it is sickening to observe the countless numbers of unseasonable fish that are from time to time brought to Billingsgate and other markets, and greedily purchased. The fact that oysters are supplied only during certain months in the year, and that the public have a general corresponding notion that they are totally unfit for food during May, June, July, and August (those four wretched months which have not the letter "r" in their names), has been greatly in their favour. Had there been no period of rest, it is almost certain that oysters would long ago -I allude to the days when there was no system of cultivation -have become extinct. Oysters begin to sicken about the end of April, so that it is well that their grand rest commences in May. The shedding of the spawn continues during the whole of the hot monthsnot but that during that period there may be found supplies of healthy oysters, but, as a general rule, it is better that there should be a total cessation of the trade during the summer season, because were the beds disturbed by a search for the healthy oysters the spawn would be scattered and destroyed. Oysters do not leave their ova, like many other marine creatures, but incubate them in the folds of their mantle, and among the lamina; of their lungs. There the ova remain surrounded by mucous matter, which is necessary to their development, and within which they pass through the embryo state. The mass of ova, or "spat" as it is familiarly called, undergoes various changes in its colour, meanwhile losing its fluidity. This state indicates, it has been said, the near termination of the development and the sending forth of the embryo to an independent existence, for by this time the young oysters can live without the protection of the maternal organs. An eminent French pisciculturist says that the animated matter escaping from the adults on breeding-banks is like a thick mist being dispersed by the winds-the spat is so scattered by the waves that only an imperceptible portion remains near the parent stock. All the rest is dissipated over the sea space ; and if these myriads of animalculae, tossed by the waves, do not meet with solid bodies to which they can attach themselves, their destruction is certain, for if they do not fall victims to the larger animals which prey upon them, they are unfortunate in not fixing upon the proper place for their thorough development. Thus we see that the spawn of the oyster is well matured before it leaves the protection of the parental shell ; and by the aid of the microscope the young animal can be seen with its shell perfect and its holding-on apparatus, which is also a kind of swimming-pad, ready to clutch the first "coigne of vantage" that the current may carry it against. My " theory " is, that the parent oyster goes on brewing its spawn for some time-I have seen it oozing from the same animal for some days-and it is supposed that the spawn swims about with the current for a short period before it falls, being in the meantime devoured by countless sea animals of all kinds. The operation of nursing, brewing, and exuding the spat from the parental shell will occupy a considerable period-say from two to four weeks. It is quite certain that the close-time for oysters is necessary and advantageous, for we seldom find this mollusc, as we do the herring and other fish, full of eggs, so that most of the operations connected with its reproduction go on in the months during which there is no dredging. As I have indicated, immense quantities of the spawn of oysters are annually devoured by other molluscs, and by fish and crustaceans of various sizes ; it is well, therefore, that it is so bountifully supplied. On occasions of visiting the beds I have seen the dredge covered with this spawn ; and no pen could number the thousands of millions of oysters thus prevented from ripening into life. Economists ought to note this fact with respect to fish generally, for the enormous destruction of spawn of all kinds must exercise a very serious influence on our fish supplies. I may also note that the state of the weather has a serious influence on the spawn and on the adult oyster-power of spawning. A cold season is very unfavourable, and a decidedly cold day will kill the spat. Some people have asserted that the oyster can reproduce its kind in twenty weeks, and that in ten months it is fullgrown. Both of these assertions are pure nonsense. At the age of three months an oyster is not much bigger than a pea, and the age at which reproduction begins has never been accurately ascertained, but it is thought to be three years. I give here one or two illustrations of oystergrowth in order to show the ratio of increase. The smallest, about the dimensions of a pin's head, may be called a fortnight old. The next size represents the oyster as it appears when three months old. The other sizes are drawn at the ages of five, eight, and twelve months respectively. Oysters are usually four years old before they are sent to the London market. At the age of five years the oyster is, I think, in its prime ; and some of our most intelligent fishermen think its average duration of life to be ten years. In these days of oyster-farming the time at which the oyster becomes reproductive may be easily fixed, and it will no doubt be found to vary in different localities. At some places it becomes saleable-chiefly, however, for fattening in the course of two years ; at other places it is three or four years before it becomes a saleable commodity; but on the average it will be quite safe to assume that at four years the oyster is both ripe for sale and able for the reproduction of its kind. Let us hope that the breeders will take care to have at least one brood from each batch before they offer any for sale. Oyster-farmers should keep before them the folly of the salmon-fishers, who kill their grilse - i.e. the virgin fish -before they have an opportunity of perpetuating their race. Another point on which naturalists differ is as to the quantity of spawn from each oyster. Some enumerate the young by thousands, others by millions. It is certain enough that the number of young is prodigious-so great, in fact, as to prevent their all being contained in the parent shell at one time ; but I do not believe that an oyster yields its young " in millions "perhaps half a million is on the average the amount of spat which each oyster can "brew" in one season. I have examined oyster-spawn (taken direct from the oyster) by means of a powerful microscope, and find it to be a liquid of some little consistency, in which the young oysters, like the points of a hair, swim actively about, in great numbers, as many as a thousand having been counted in a very minute globule of spat. The spawn, as found floating on the water, is greenish in appearance, and each little splash may be likened to an oyster nebula, which resolves itself, when examined by a powerful glass, into a thousand distinct animals. 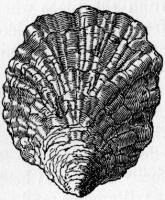 The oyster, it is now pretty well determined, is hermaphrodite, and it is very prolific, as has been already observed, but the enormous fecundity of the animal is largely detracted from by bad seasons ; for, unless the spawning season be mild, soft, and warm, there is usually a very partial full of spat, and of course quite a scarcity of brood ; and even if one be the proprietor of a large bed of oysters, there is no security for the spawn which is emitted from the oysters on that bed falling upon it, or within the bounds of one's own property even ; it is often enough the case that the spawn falls at a considerable distance from the place where it has been emitted. Thus the spawn from the Whitstable and Faversham Oyster Companies' beds - and these contain millions of oysters in various stages of progress -falls usually on a large piece of ground between Whitstable and the Isle of Thanet, formerly common property, but lately given by Act of Parliament to a company recently formed for the breeding of oysters. The saving of the spawn cannot be effected unless it falls on proper ground - i.e. ground with a shelly bottom is best, for the infant animal is sure to perish if it fall among mud or upon sand ; the infant oyster must obtain a holding-on place as the first condition of its own existence. Oysters have not on the aggregate spawned extensively during late years. The greatest fall of spawn ever known in England occurred forty-six years ago. On being exuded from the parental shell, the spawn of the oyster at once rises to the surface, where its vitality is easily affected, and it is often killed in certain places by snow-water or ice. A genial warmth of sunshine and water is considered highly favourable to its proper development during the few days it floats about on the surface. It is thought that not more than one oyster out of each million arrives at maturity. It is curious to note that some oysters have immense shells with very little " meat " in them. I recently saw in a restaurant several oysters, much larger externally than crownpieces, with the " meat " about the size of a sixpence: these were Firth of Forth oysters from Cockenzie. It is not easy to determine from the external size of the animal the amount of " meat " it will yield-apparently, " the bigger the oyster the smaller the meat." In the early part of the season only very small oysters are sold in Edinburgh-the reason assigned being that all the best dredgers are " away at the herring," and that the persons left behind at the oyster-beds are only able to skim them, so that, for a period of about six weeks, we merely obtain the small fry that are lying on the top. It is quite certain that as the season advances the oysters obtained are larger and of more decided flavour. In the "natives" obtained at Whitstable the shell and the meat are pretty much in keeping as to size, and this is an advantage. The Abbé Diquemarc, who has keenly observed the habits of the principal mollusca, assures us that oysters, when free, are perfectly able to transport themselves from one place to another, by simply causing the sea-water to enter and emerge suddenly from between their valves ; and these they use with extreme rapidity and great force. By means of the operation now described, the oyster is enabled to defend itself from its enemies among the minor crustacea, particularly the small crabs, which endeavour to enter the shell when it is half open. "Some naturalists," the Abbé says, "go the length of allowing the oyster to have great foresight," which he illustrates by an allusion to the habits of those found at the sea-side. "These oysters," he says, "exposed to the daily change of tides, appear to be aware that they are likely to be exposed to dryness at certain recurring periods, and so they preserve water in their shells to supply their wants when the tide is at ebb. This peculiarity renders them more easy of transportation to remote distances than those members of the family which are caught at a considerable distance from the shore." The secret of there being only a holding-on place required for the spat of the oyster to insure an immensely-increased supply having been penetrated by the French people-and no doubt they are in some degree indebted to our oyster-beds on the Colne and at Whitstable for their idea-the plan of systematic oyster-culture was easy enough, as I will immediately show. A few initiatory experiments, in fact, speedily settled that oysters could be grown in any quantity. Strong pillars of wood were driven into the mud and sand ; arms were added; the whole was interlaced with branches of trees, and various boughs besides were hung over the beds on ropes and chains, whilst others were sunk in the water and kept down by a weight. A few boat-loads of oysters being laid down, the spat had no distance to travel in search of a home, but found a resting-place almost at the moment of being exuded; and, as the fairy legends say, " it grew and it grew," till, in the fulness of time, it became a marketable commodity. But the history of this modern phase of oyster-farming, as practised on the foreshores of France, is so interesting as to demand at my hands a rather detailed notice, for it is one of the most noteworthy circumstances connected with the revived art of fish-culture, that it has resulted in placing upon the shores of France a countless number of fish-farms for the cultivation of the oyster alone. It is no exaggeration to say, that about twenty-five years ago there was scarcely an oyster of native growth in France ; the beds-and I cite the case of France as a warning to people at home, I mean as regards our Scottish oyster-beds-had become so exhausted from overdredging as to be unproductive, so far as their money value was concerned, and to be totally unable to recover themselves so far as their power of reproductiveness was at stake. And the people were consequently in despair at the loss of this favourite adjunct of their banquets, and had to resort to other countries for such small supplies as they could obtain. As an illustration of the overdredging that had prevailed, it may be stated that oyster-farms which formerly employed 1400 men, with 200 boats, and yielded an annual revenue of 400,000 francs, had become so reduced as to require only 100 men and 20 boats. Places where at one time there had been as many as fifteen oyster-banks, and great prosperity among the fisher class, had become, at the period I allude to, almost oysterless. St. Brieuc, Rochelle, Marennes, Rochefort, etc., had all suffered so much that those interested in the fisheries were no longer able to stock the beds, thus proving that, notwithstanding the great fecundity of these sea animals, it is quite possible to overfish them, and thoroughly exhaust their reproductive power. It was under these circumstances that M. Coste instituted that plan of oyster-culture which has been so much noticed of late in the scientific journals, and which appears to have been inspired by the plan of the musselfarms in the Bay of Aiguillon, and the oyster-pares of Lake Fusaro, so far at least as the principle of cultivation is concerned. At the instigation of the French Government, he made a voyage of exploration round the coasts of France and Italy, in order to inquire into the condition of the sea-fisheries, which were, it was thought, in a declining condition. It was his "mission," and he fulfilled it very well, to see how these marine fisheries could be artificially aided, as the fresh-water fisheries had been aided through the re-discovery by Joseph Remy of the long-forgotten plan of pisciculture, as already detailed in a preceding portion of this work. The breeding of oysters was a business pursued with great assiduity during what I have called the gastronomic age of Italy, the period when Lucullus kept a stock of fish valued at £50,000 sterling, and Sergius Orata invented the art of oysterculture. There is not a great deal known about this ancient gentleman, except that he was an epicure of most refined taste (the " master of luxury " he was called in his own day), and some writers of the period thought him a very greedy person, a kind of dealer in shell-fish. It was thought also that he was a housebroker or person who bought or built houses, and having improved them, sold them to considerable advantage. He received, however, an excellent character, while standing his trial for using the public waters of Lake Lucrinus for his own private use, from his advocate Lucinus Crassus, who said that the revenue officer who prevented Orata was mistaken if he thought that gentleman would dispense with his oysters, even if he was driven from the Lake of Lucrinus, for, rather than not enjoy his molluscous luxury, he would grow them on the tops of his houses. Lake Fusaro, of which I give a kind of bird's-eye view, is highly interesting to all who take an interest in the prosperity of the fisheries, as the first seat of oyster-culture. It is the Avernus of Virgil, and is a black volcanic-looking pool of water, about a league in circumference, which lies between the site of the Lucrine Lake-the lake used by Orata - and the ruins of the town of Cumae. It is still extant, being even now, as I have said, devoted to the highly profitable art of oyster-farming, yielding, as has often been published, from this source an annual revenue of about £1200. This classic sheet of water was at one time surrounded by the villas of the wealthy Italians, who frequented the place for the joint benefit of the sea-water baths, and the shell-fish commissariat, which had been established in the two lakes (Avernus and Lucrine). The place, which, before then, was overshadowed by thick plantations, had been consecrated by the superstitious to the use of the infernal gods. The accompanying engraving gives a general view of Lake Fusaro (the Avernus of the ancients), showing here and there the stakes surrounding the artificial banks, the single and double ranges of stakes on which the faggots are suspended, and at one extremity the labyrinths, in the face of which is a canal of from 2y' to 3 metres broad and 1 1/2 metre deep joining the lake to the sea. A small lake, believed to be the ancient Cocytus, communicates with this canal. The pavilion in the lake is the ordinary residence of the persons in charge of the fishery. used to collect the spawn, which, as I have already said, requires, within forty-eight hours of its emission, to secure a holding-on place or be lost for ever. The plan of the Fusaro oyster-breeders struck M. Coste as being eminently practical and suitable for imitation on the coasts of France: he had one of the stakes pulled up, and was gratified to find it covered with oysters of all ages and sizes. 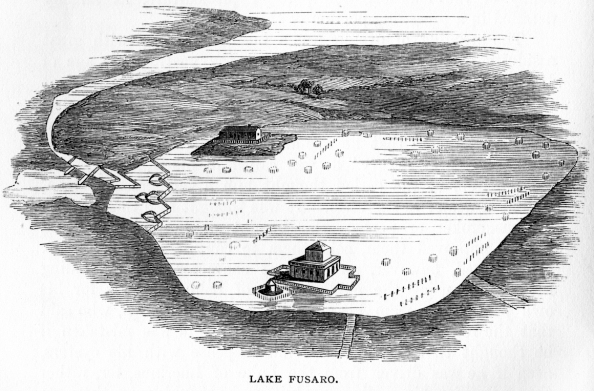 The Lake Fusaro system of cultivation was therefore, at the instigation of Professor Coste, strongly recommended for imitation by the French Government to the French people, as being the most suitable to follow, and experiments were at once entered upon with a view to prove whether it would be as practicable to cultivate oysters as easily among the agitated waves of the open sea as in the quiet waters of Fusaro. In order to settle this point, it was determined to renew the old oyster-beds in the Bay of St. Brieuc, and notwithstanding the fact that the water there is exceedingly deep and the winds very violent, immediate and almost miraculous success was the result. The fascines laid down soon became covered with seed, and branches were speedily exhibited at Paris, and other places, containing thousands of young oysters. 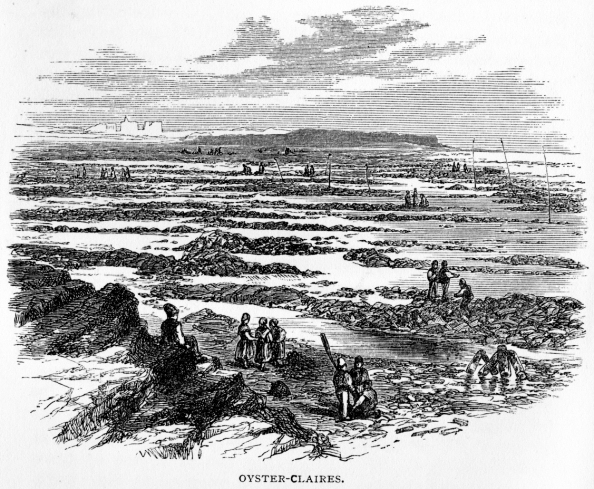 The experiments in oysterculture tried at St. Brieuc were commenced early, on part of a space of 3000 acres that was deemed suitable for the reception of spat. 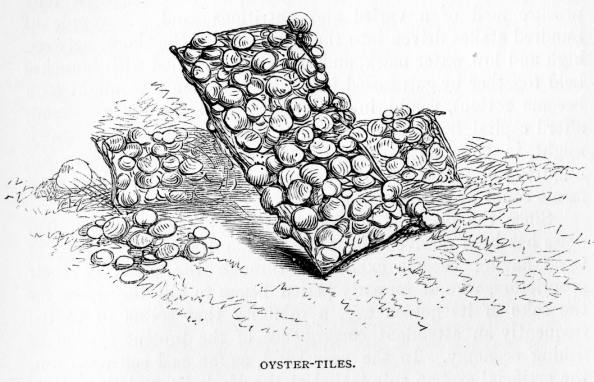 A quantity of breeding oysters, approaching to three millions, was laid down either on the old beds or on newly-constructed longitudinal banks ; these were sown thick on a bottom composed chiefly of immense quantities of old shells-the "middens" of Cancale in fact, where the shell accumulation had become a nuisance-so that there was a more than ordinary good chance for the spat finding at once a proper holding-on place. Then again, over some of the new banks, fascines made of boughs tightly tied together were sunk and chained over the beds, so as to intercept such portions of the spawn as were likely, upon rising, to be carried away by the force of the tide. 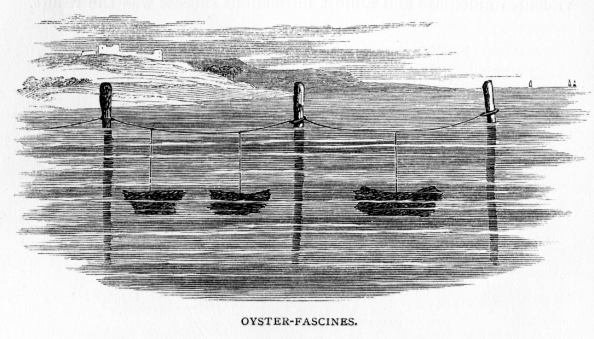 In less than six months the success of the operation in the Bay of St. Brieuc was assured ; for, at the proper season, a great fall of spawn had occurred, and the bottom shells were covered with the spat, while the fascines were so thickly coated with young oysters that an estimate of 20,000 for each fascine was not thought an exaggeration. Twelve months, however, before the date of the experiments I have been describing at St. Brieuc, the artificial culture of oysters had successfully commenced on another part of the coast-namely, the Ile de Re off the shore of the lower Charente (near la Rochelle), in the Bay of Biscay, which may now be designated the capital of French oysterdom, having more parcs and claires than Marennes, Arcachon, Concarneau, Cancale, and all the rest of the coast put together, and which, before it became celebrated for its oyster-growing, was only known, in common with other places in France, for its successful culture of the vine. It is curious to note the rapid growth of the industry of oyster-culture on the Ile de Re. It was begun so recently as 1858, and there are now upwards of 4000 parks and claires upon its shores, and the people may be seen as busy in their fish-parks as the market-gardeners of Kent in their strawberrybeds. Oyster-farming on the Ile was inaugurated by one Boeuf, a stone-mason. This shrewd fellow, who was a keen observer of nature, and had seen the oyster-spat grow to maturity, began thinking of oyster-culture simultaneously with Professor Coste, and wondering if it could be carried out on those portions of the public foreshore that were left dry by the ebb of the waters. He determined to try the experiment on a small scale, so as to obtain a practical solution of his " idea," and, with this view, he enclosed a small portion of the foreshore of the island by building a rough dyke about eighteen inches in height. In this park lie laid down a few bushels of growing oysters, placing amongst them a quantity of large stones, which he gathered out of the surrounding mud. This initiatory experiment was so successful, that in the course of a year he was able to sell £6 worth of oysters from his stock. This result was of course very encouraging to the enterprising mason, and the money was just in a sense found money, for the oysters went on growing while he was at work at his own proper business as a mason. Elated by the profit of his experiment, he proceeded to double the proportions of his park, and by that means more than doubled his oyster commerce, for, in 1861, he was able to dispose of upwards of £30 worth, and this without impoverishing, in the least degree, his breeding stock. He continued to increase the dimensions of his farm, so that by 1862 his sales had increased to £40. As might have been expected, Boeuf's neighbours had been carefully watching his experiments, uttering occasional sneers, no doubt, at his enthusiasm ; but, for all that, quite ready to go and do likewise whenever the success of the industrious mason's experiments became sufficiently developed to show that they were profitable as well as practical. After Boeuf had demonstrated the practicability of oyster-farming, the extension of the system over the foreshores of the island, between Point de Rivedoux and Point de Lome, was rapid and effective ; so much so that two hundred beds were conceded by the Government previous to 1859, while an additional five hundred beds were speedily laid down, and in 1860 large quantities of brood were sold to the oyster-farmers at Marennes, for the purpose of being manufactured into green oysters in their claires on the banks of the river Seudre. The first sales after cultivation had become general amounted to £126, and the next season the sum reached in sales was upwards of £500, and these monies, be it observed, were for very young oysters ; because, from an examination of the dates, it will at once be seen that the brood had not had time to grow to any great size. So rapid indeed has been the progress of oyster-culture at the Ile de Re, that what were formerly a series of enormous and unproductive mud-banks, occupying a stretch of shore about four leagues in length, are now so trans-formed, and the whole place so changed, that it seems the work of a miracle. Various gentlemen who have inspected these farms for the cultivation of oysters speak with great hopefulness about the success of the experiment. Mr. Ashworth, so well known for his success as a salmon fisher and breeder in Ireland, tells me that oyster-farming on the shores of the French coast is one of the greatest industrial facts of the present age, and thinks that oyster-farming will in the end be even more profitable than salmon-breeding. There is only one drawback connected with these and all other sea-farms in France : the farmers, we regret to say, are only "tenants at will," [Mr. Ashworth, in a communication to Mr. Barry, one of the Commissioners of Irish Fisheries, says-"No charge is made for the oyster-parks, but each plot is marked and defined on a map, and the produce is considered to be the private property of the person who establishes it. They vary in size twenty or thirty yards square, the stone or tiles are placed in rows about five feet apart, with the ends open so as to admit of the wash of the tide in and out."] and liable at any moment to be ejected ; but notwithstanding this disadvantage the work of oyster-culture still goes bravely forward, and it is calculated, in spite of the bad spatting of the last three years, that there is a stock of oysters in the beds on the Ile de Reaccumulated in only six years-of the value of upwards of £100,000. successful of late years as to be offered a sum of £100 for the brood attached to twelve of their rows of stones, the cost of laying these down being about two hundred francs! To construct an oyster-bed thirty yards square costs about £12 of English money, and it has been calculated that the return from some of the beds haa been as high as 1000 per cent! The whole industry of the Ile is wonderful when it is considered that it has been all organised in a period of seven years. Except a few privately-kept oysters, there was no oyster establishment on the island previous to 1858.
is the moral success that has accrued to the experiment. Excellent laws have been enacted by the oyster-farmers themselves for the government of the colony. A kind of parliament has been devised for carrying on arguments as to oyster-culture, and to enable the four communities, into which the population has been divided, to communicate to each other such information as may be found useful for the general good of all engaged in oyster-farming. Three delegates from each of the communities are elected to conduct the general business, and to communicate with the Department of Marine when necessary. A small payment is made by every farmer as a contribution to the general expense, while each division of the community employs a special watchman to guard the crops, and see that all goes on with propriety and good faith ; and although each of the oyster-farmers of the Ile de Re cultivates his own park or claire for his own sole profit and advantage, they most willingly obey the general laws that have been enacted for the good of the community. It is pleasant to note this. We cannot help being gratified at the happy moral results of this wonderful industry, and it will readily be supposed that with both vine-culture (for the islanders have fine vineyards) and oyster-culture to attend to, these farmers are kept very busy. Indeed, the growing commerce-the export of the oysters, and the import of other commodities for the benefit of so industrious a population-incidental to such an immense growth of shellfish as can be carried on in the 4000 parks and claires which stud the foreground of Re must be arduous ; but as the labour is highly remunerative, the labourers have great cause for thankfulness. It is right, however, to state that, with all the care that can be exercised, there is still an enormous amount of waste consequent on the artificial system of culture; the present calculation is, that even with the best possible mode of culture the average of reproduction is as yet only fourteenfold; but it is hoped by those interested that a much larger ratio of increase will be speedily attained. This is desirable, as prices have gone on steadily increasing since the time that Boeuf first experimented. In 1859 the sales were effected at about the rate of fifteen shillings per bushel, for the lowest qualities-the highest being double that price ; these were for fattening in the claires, and when sold again they brought from two to three pounds per bushel. One of the most lucrative branches of foreign oyster-farming may be now described - i.e. the manufacture of the celebrated green oysters. The greening of oysters, many of which are brought from the Ile de Re parks, is extensively carried on at Marennes, on the banks of the river Seudre, and this particular branch of oyster industry, which extends for leagues along the river, and is also sanctioned by free grants from the State, has some features that are quite distinct from those we have been considering, as the green oyster is of considerably more value than the common white oyster. The peculiar colour and taste of the green oyster are imparted to it by the vegetable substances which grow in the beds where it is manipulated. This statement, however, is scarcely an answer to the question of "why," or rather "how," do the oysters become green? Some people maintain that the oyster green is a disease of the liver-complaint kind, whilst there are others who attribute the green colour to a parasite that overgrows the mollusc. But the mode of culture adopted is in itself a sufficient answer to the question. The industry carried on at Marennes consists chiefly of the fattening in claires, and the oysters operated upon are at one period of their lives as white as those which are grown at any other place; indeed it is only after being steeped for a year or two in the muddy ponds of the river Seudre that they attain their much-prized green hue. The enclosed ponds for the manufacture of these oysters-and, according to all epicurean authority, the green oyster becomes "the oyster par excellence" require to be water-tight, for they are not submerged by the sea, except during very high tides. Each claire is about one hundred feet square. The walls for retaining the waters require therefore to be very strong; they are composed of low but broad banks of earth, five or six feet thick at the base and about three feet in height. These walls are also useful as forming a promenade on which the watchers or workers can walk to and fro and view the different ponds. The flood-gates for the admission of the tide require also to be thoroughly watertight and to fit with great precision, as the stock of oysters must always be kept covered with water ; but a too frequent flow of the tide over the ponds is not desirable, hence the walls, which serve the double purpose of both keeping in and keeping out the water. A trench or ditch is cut in the inside of each pond for the better collection of the green slime left at each flow of the tide, and many tidal inundations are necessary before the claire is thoroughly prepared for the reception of its stock. When all these matters of construction and slime-collecting have been attended to, the oysters are then scattered over the ground, and left to fatten. When placed in these greening claires they are usually from twelve to sixteen months old, and they must remain for a period of two years at least before they can be properly greened, and if left a year longer they are all the better; for I maintain that an oyster should be at least about four years old before it is sent to table. In a privately-printed pamphlet on the French oyster-fisheries, sent to me by Mr. Ashworth, it is stated that oysters deposited in the claires for feeding possess the same powers of reproduction as those kept in the breedingponds. " Their progeny is deposited in the same profusion, but that progeny not coming in contact with any solid body, it inevitably perishes, unless it can attach itself to the vertical sides of some erection." A very great deal of attention must be devoted to the oysters while they are in the greening-pond, and they must be occasionally shifted from one pond to another to ensure perfect success. Many of the oyster-farmers of Marennes have two or three claires suitable for their purpose. The trade in these green oysters is very large, and they are found to be both palatable and safe, the greening matter being furnished by the sea. Some of the breeders, or rather manufacturers, of green oysters, anxious to be soon rich, content themselves with placing adult oysters only in these claires, and these become green in a very short time, and thus enable the operator to have several crops in a year without very much trouble. The claires of Marennes furnish about fifty millions of green oysters per annum, and these are sold at very remunerative prices, yielding an annual revenue of something like two and a half millions of francs. As to the kind of ground most suitable for oyster-growth, Dr. Kemmerer, of St. Martin's (Ile de Re), an enthusiast in oyster-culture, gives us a great many useful hints. I have summarised a portion of his information :-The artificial culture of the oyster may be considered to have solved an important question-namely, that the oyster continues fruitful after it is transplanted from its natural abode in the deep sea to the shores. This removal retards but never hinders fecundation. The sea oyster, however, is the most prolific, as the water at a considerable depth is always tranquil, which is a favourable point in oyster-growth ; but the shore oyster-banks will also be very productive, having two chances of replenishment-namely, from the parent oysters in the pares, and from those currents that may float seed from banks in the sea. Muddy ground is excellent for the growth of oysters ; they grow in such localities very quickly, and become saleable in a comparatively short space of time. Dry rocky ground is not so suitable for the young oyster, as it does not find a sufficiency of food upon it, and consequently languishes and dies. Marl is the most esteemed, and on it the oyster is said to become perfect in form and excellent in flavour. In the marl the young oyster finds plenty of food, constant heat, and perfect quiet. Wherever there is mud and sun there will be found the little molluscs, crustacea, and swimming infusoria, which are the food of the oyster. The culture of the oyster in the mud-ponds and in the marl-a culture which ought some day to become general-changes completely its qualities ; the albumen becomes fatty, yellow or green, oily, and of an exquisite flavour. The animal and phosphorus matter increases, as does the osmozone. This oyster, when fed, becomes exquisite food. In effecting the culture of the sea-shores and of the marl-ponds, I am pursuing a practical principle of great importance, by the conversion of millions of shore oysters, squandered without profit, into food for public consumption. The green oyster, to this day, has only been regarded as a luxury for the tables of the rich; but, as I have indicated, there are an immense number of farms or ponds on the Seudre, and I would like to see it used as food by everyone." The French oyster-farmers are happy and prosperous. The wives assist their husbands in all the lighter labours, such as separating and arranging the oysters previous to their being placed on the claires. It is also their duty to sell the oysters; and for this purpose they leave their home about the end of August, and proceed to a particular town, there to await and dispose of such quantities of shell-fish as their husbands may forward to them. In this they resemble the fisherwomen of other countries. The Scotch fishwives do all the business connected with the trade carried on by their husbands ; it is the husbands' duty to capture the fish only, and the moment they come ashore their duties cease, and those of their wives and daughters begin with the sale and barter of the fish. bottom for oysters is so good as the natural one of "cultch," as the old oyster-shells are called, but the tile is often of service in catching the "floatsome," as the dredgers call the spawn, and to secure that should be one of the first objects of the oyster-farmer. We glean from these proceedings of the French pisciculturists the most valuable lessons for the improvement and conduct of our British oyster-parks. If, as seems to be pretty certain, each matured oyster yields about two millions of young per annum, and if the greater proportion of these can be saved by being afforded a permanent resting-place, it is clear that, by laying down a few thousand breeders, we may, in the course of a year or two, have, at any place we wish, a large and reproductive oyster-farm. With reference to the question of growth, Coste tells us that stakes which had been fixed for a period of thirty months in the lake of Fusaro were quite loaded with oysters when they came to be removed. These were found to embrace a growth of three seasons. Those of the first year's spawning were ready for the market ; the second year's brood were a good deal smaller; whilst the remainder were not larger than a lentil. To attain miraculous crops similar to those once achieved in the Bay of St. Brieuc, or at the Ile de Re, little more is required than to lay down the spawn in a nice rocky bay, or in a place paved for the purpose, and having as little mud about it as possible. A place having a good stream of water flowing into it is the most desirable, so that the flock may procure food of a varied and nutritious kind. A couple of hundred stakes driven into the soft places of the shore, between high and low water mark, and these well supplied with branches held together by galvanised iron wire (common rope might soon become rotten), would, in conjunction with the rocky ground, afford capital holding-on places, so that any quantity of spawn might, in time, be developed into fine "natives." There are hundreds of places on the English and Irish coasts where such farms could be advantageously laid down. Since the previous editions of this work were issued, bad news has been received about the French oyster farms, many of them having become exhausted through the greed of their proprietors, who at an early period began to kill the goose for the sake of its golden egg, a calamity that seems to be too frequently an attendant consequence of the present system of fishing economy. In the year 1863, as far as I can ascertain, the artificial system culminated at the Ile de Re, and since then the beds have yearly become less prolific. 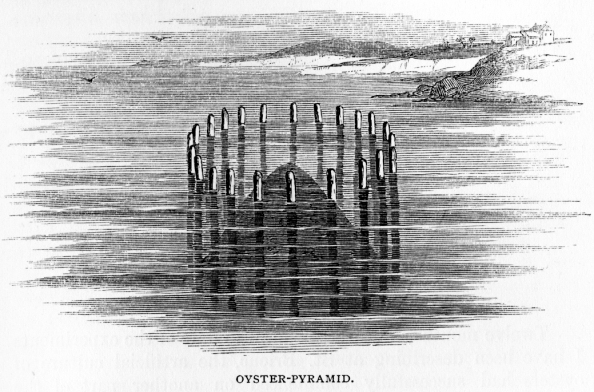 A great amount of the miscellaneous information regarding oyster-growth and oyster-commerce, which has been circulated during the last five years, is not of a reliable nature ; but many of the circumstances attendant on artificial culture are interesting, and have been proved to be correct, although they seem contradictory : as, for instance, that oysters if spawned on a muddy bottom are lost, although the same muddy bottom is highly suitable for the feeding 'stages of the mollusc. It is also remarkable that breeding oysters do not fatten, and that fat oysters yield no spat. 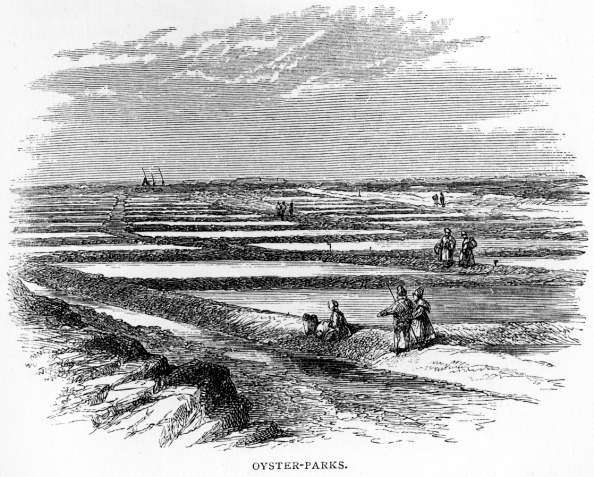 There has been some controversy as to whether transplanted oysters will breed; opinions differ, and it is on record that such a remarkable spat once fell on the Whitstable grounds as to provide a stock for eleven years, including, of course; what was gathered towards the end of that period. A close time for oysters is a law of the land ; but for all that we might have-indeed, we have now-oysters all the year round, because all oysters do not sicken or spat at the same period; in fact the economy of fish growth is not yet understood either by naturalists or fishermen; as an instance of mal-economy we have salmon rivers closed at the very time they ought to be open, some rivers being remarkable for early spawning fish, whilst others are equally so for the tardiness with which their scaly inhabitants repeat the story of their birth. In time, when we understand better how to manage our fisheries, the supplies of all kinds of round and shell fish will doubtless be better regulated than at present. The following theory of the spat was promulgated by the author through the columns of the Times:- " In an open expanse of sea the spat may be carried to great distances by tidal influence, or a sharp breeze upon the water may waft the oyster-seed many a long mile away. Every bed has its own time of spatting thus, one of a series of scalps may be spatting on a fine warm day, when the sea is like glass, so that the spat cannot fail to fall; while on another portion of the beds the spat may fall on a windy day, be thus left to the tender mercy of a fiercely receding tide, and so be lost, or fall mayhap on ungenial bottom a long way from the shore. On the Isle of Oleron, which supplies the green oyster breeders of Marennes with such large quantities, it is quite certain that in the course of the summer a friendly -wave will waft large quantities of spat into the artificial pares, when it is known that the oysters in these pares have not spawned. Where does this foreign spat come from ? The men say it comes off some of the natural beds of the adjoining sea-is driven in by the tide, and finds a welcome resting-place on the artificial receivers of their pares. It is altogether an erroneous idea to suppose that there are some seasons when the oyster does not spat, because of the cold weather, etc. Some of the pares had spatted at Arcachon this year  in very ungenial weather. The spatting of the oyster does not depend on the weather at all, but the destination of the spat does, because if the tiny seedling oyster does not fall on propitious ground it is lost for ever. New oyster-beds are often discovered in places where it is certain oysters did not exist in previous years. How came they then to be formed ? The spat must have been blown upon that ground by the ill wind that carried it away from the spot where it was expected to fall. If the spat exuded by the large quantity of oysters known to be stocked in the pares at Whitstable, in Kent, the home of the " native," were always to fall on the cultch of Whitstable, instead of on the adjoining flats and elsewhere, the company would soon become enormously wealthy.